A very common question asked by many clients is whether they should have a bridal trial before their wedding day. I decided to dedicate a post as to why I think you should and then you can make your own decision. You put so much effort into all other parts of your wedding so don’t fall short with your hair and makeup. I am still surprised to this day when I speak to some brides to be who have had two or even three trials prior to me. Your makeup and hair needs to be flawless and lightweight, cope in all different lights and environments but most importantly last all day and night. One of my favourite parts is getting to know you and most of this happens in our conversations via email and then on the trial. We are spending one of the most important mornings of your life with you after all. I already know what I want so why do I need a trial? While you may already have every little details down for how you would like your hair and makeup I would still tell you that it’s important to have a trial. You have to bear in mind that we use so many different products some of which might not work for your skin or the look and this is what we may need to eliminate from the trial. Having pictures of hair and makeup on other people is all well and good but it never looks the same on you and this is very common, often we will have recreated a look from a picture on a client and they make changes. Unless you have the same face shapes and features as the person you have seen the look on I can guarantee it will not look the same. This is really important and there are certain things I would tell you to look at before making a decision. The most obvious for top of the list should be their portfolio of work. A huge one for me is being able to view work that hasn’t been photoshopped, airbrushed or had filters applied. Airbrushing. 99% of my photos (the non-professional ones) have not been touched. As I’m sure you’re aware there is far too much airbrushing going on nowadays and everyone has access to it with the likes of Instagram and mobile phones. Cv. A Cv should be readily available for clients to view. Reviews. Find out what other brides have said. Website. I’m a HUGE geek when it comes to anything online, I feel it reflects personality and obviously work. A lot of time and effort goes into my site including constant blogging, picture updating as well as having the latest add-ons like my bridal price quoting. I update my backgrounds too and front pages as well as all social media. 95% of my work comes through my website and I believe that is down to the time that goes into making it stand out from the rest. Products. You need to know what’s going on your face right? Hopefully you may now have been persuaded to have a trial before your wedding day. If so there are some more commonly asked questions answered below. I encourage all trials where possible to be done around dinner time as this allows a full day to see how the makeup and hair lasts. I would say YES, go for it! This is your chance to try anything you’re unsure of and see if it works for you. Most commonly it will be eyelashes and 99% of the time when a client either hasn’t worn them before or has had a bad experience they end up loving them and are totally converted. Again with you having the rest of the day I tell you to keep looking in different mirrors, take pictures and use different rooms to get a full idea of how it all looks in all lights and environments. If you can pop over to a friends/family do this too and get others opinions. In saying all this I wouldn’t stray too far from what you like or are used to as it may not be for you and you like what you like for a reason. I would definitely recommend tweaks over big changes but we talk about all this before the trial and when we arrive so if you’re unsure just ask, that’s what we are there for after all. This is exactly why you should have a trial, you probably won’t have had your makeup or hair this way before so we need to make sure it’s perfect for your wedding day. We ask you to go about your day as usual but just keep checking and making sure everything is how you want it. I ask you to let me know the following day how everything lasted and if there are any changes you would like to make for the day. As an example if you noticed the curls dropped slightly we would either use a different curl on the day or make them tighter. Your chin may have gone a little shiny after a few hours so I would then make sure I applied a matte primer and extra powder on the day. Don’t worry! Sometimes they haven’t arrived and other times you’ve just not decided what you want yet, we can still do the trial. If you haven’t decided yet this could be your perfect opportunity to go shopping. We had a bride recently that went to Debenhams after the trial with her Mum and picked out the head piece, she found this easier as she had her hair and makeup in place so it made it easier to make a decision. If you haven’t got them available for the trial it’s not a problem as you will know exactly where you want them for the day and veils are easily worked into hair styles, we will discuss where they are best placed once your hair and makeup is complete. I personally don’t think you have to as you will know from having your own hair and makeup done if you are happy with us, how we work but most importantly your hair and makeup. Some brides to be book one of their bridesmaids on for makeup and hair to make sure they are happy with the look they’ve chosen for them so this is something else to consider. Pintrest is a great place to start with this, create a board and get pinning. You can share this with me before hand or save it for the trial. I find there’s usually more hair pictures for this part as bride usually have an idea in their head for makeup or I get told to go with what I think. 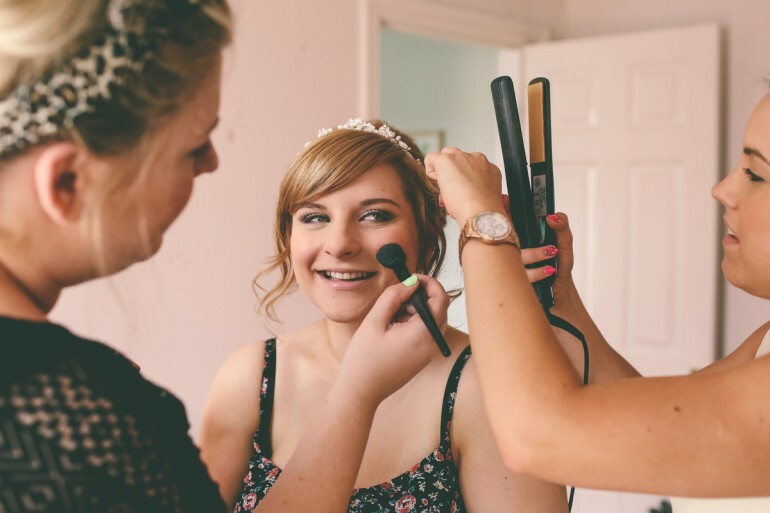 A good tip if you’re not sure what style will suit best is to have a look at the professional pictures of your dress as they will have chosen a hair and makeup style to suit the dress.